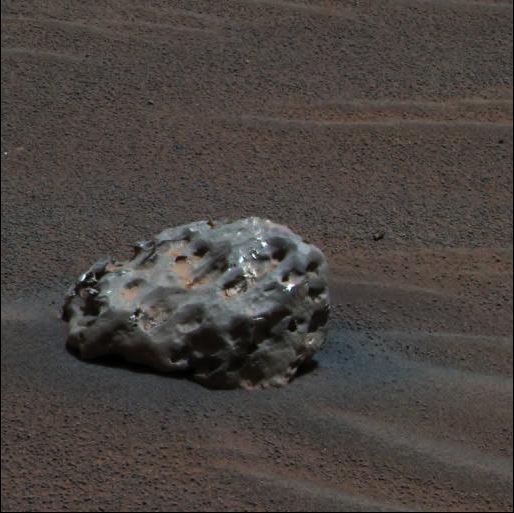 NASA's Mars Rovers Are Great at Finding Meteorites! Oileán Ruaidh: This is an image of the "Oileán Ruaidh" meteorite, found by NASA's Mars Exploration Rover Opportunity in September 2010. 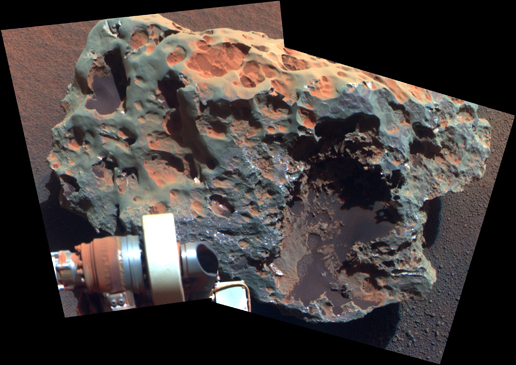 The science team used two tools on Opportunity's arm -- the microscopic imager and the alpha particle X-ray spectrometer -- to inspect the rock's texture and composition. Information from the spectrometer confirmed that the rock is a nickel-iron meteorite. The team informally named the rock "Oileán Ruaidh" (pronounced ay-lan ruah), which is the Gaelic name for an island off the coast of northwestern Ireland. Image and caption by NASA. Hard to Find on Earth but Abundant on Mars? 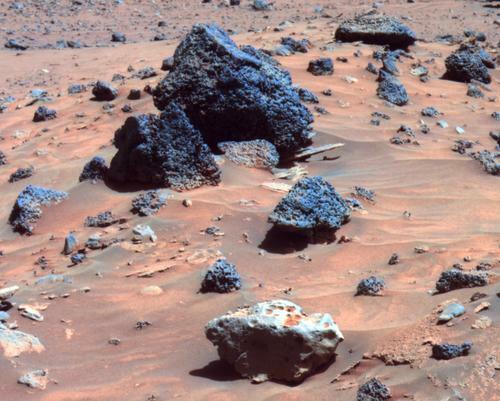 NASA's two Mars Rovers have found some spectacular meteorites. On Earth, the only humans who are as successful at finding meteorites are professional meteorite hunters. Are meteorites that abundant on Mars or are these Rovers simply lucky? The answer to this question has a lot to do with the environment of the two planets. The surface of Earth has an environment that is rich in oxygen and moisture - both of which are rapidly destructive to iron meteorites. A meteorite that lands on Earth's surface would rust away in a blink of geologic time. Mars, however, has very little oxygen and moisture in its atmosphere and surface soils. Meteorites that land on Mars can remain in excellent condition for millions - or even billions - of years. Mars is the perfect place to hunt for meteorites. Shelter Island: NASA's Mars Exploration Rover Opportunity drove just 700 meters after finding the "Block Island" meteorite and spotted another! On October 1, 2009 it took this image of a meteorite that has been named "Shelter Island." The pitted rock is about 47 centimeters long. Image and caption by NASA. Enlarge. 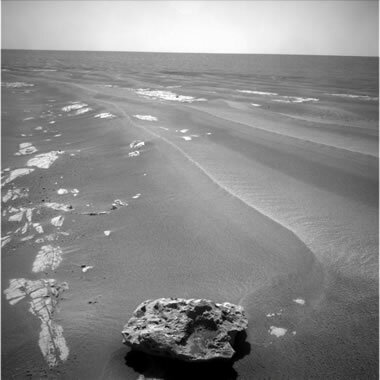 Block Island: This is a picture of "Block Island," the largest meteorite yet to be found on Mars. It is about 60 centimeters across (about 2 feet) and is estimated to weigh about one-half ton. Analysis of its composition by Rover Opportunity's alpha particle X-ray spectrophotometer reveals that it is rich in iron and nickel - proof positive that it is an iron meteorite. This photo was taken by the navigation camera on NASA's Mars Exploration Rover Opportunity on July 28, 2009. 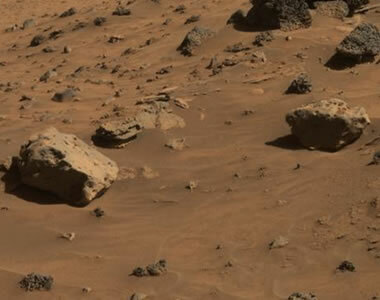 The Mars Rover drove right past the rock, but NASA researchers noticed it a few days later in an image that was taken and transmitted down to Earth. So they sent Opportunity back to check out the rock and touch it with its robotic arm for an analysis. Image and caption by NASA. Enlarge. "Heat Shield Rock" is the first meteorite ever identified on the surface of another planet. It is a baseball-size iron-nickel meteorite discovered by NASA's Mars Exploration Rover Opportunity on January 6, 2005. Its composition and identity as a meteorite were confirmed by the Rover's spectrophotometer - it determined that "Heat Shield Rock" was composed of iron and nickel. The Meteoritical Society originally named it "Meridiani Planum" after the location where it was found - this is the traditional naming convention for meteorites found on Earth. However, the name "Heat Shield Rock" has become more popular. It received that name because it was discovered near the location where Opportunity discarded its heat shield. How long the meteorite has been on the surface of Mars is unknown, however, it shows very little sign of rusting or other alteration. Image and caption by NASA. Enlarge Image. 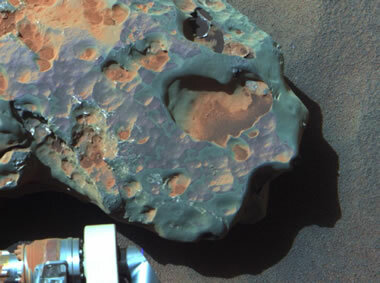 Block Island (false color): A false-color image of the Martian meteorite nicknamed "Block Island." 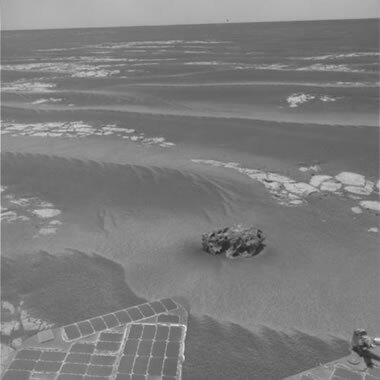 This image was taken with the panoramic camera of NASA's Mars Exploration Rover Opportunity on July 28, 2009. The false color enhances the contrast of different types of soil and meteorite material visible in the image. Image and caption by NASA. Enlarge Image. What Do the Meteorites Reveal About Mars? NASA scientists are fascinated with the Mars meteorites because they reveal interesting information about the environment of Mars. For example, the "Block Island" meteorite (pictured) is much too large to have landed intact given the current thinness of the Martian atmosphere. A thicker atmosphere would be needed to cushion its fall. With this information, scientists suspect that the Block Island meteorite fell billions of years ago when the atmosphere of Mars was much thicker. 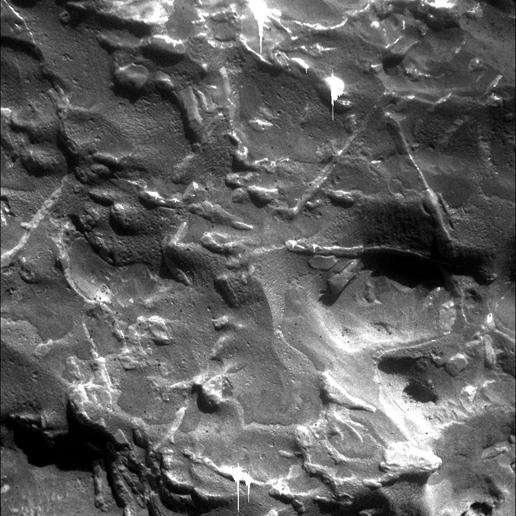 The Mars meteorites also display very little surface alteration. This confirms that the atmosphere and surface soil of Mars contain very little moisture or free oxygen. Block Island Widmanstatten: This is a close-up image of a 32 millimeter by 32 millimeter surface on the Block Island meteorite. It reveals a triangular pattern of small ridges characteristic of iron-nickel meteorites found on Earth, especially after they have been cut, polished and etched. This is known as a Widmanstatten Pattern when observed in Earth meteorites. This pattern results from the crystallization of the minerals kamacite and taenite. The two minerals differ in their resistance to etching by acid or erosion by wind-blown sand. This results in the triangular pattern developing in positive relief on the specimen surface. Image and caption by NASA. Enlarge Image. Allan Hills: The rock in the center foreground of this image is suspected of being an iron meteorite. This meteorite was found by NASA's Mars Exploration Rover Spirit in April, 2006 and has been named "Allan Hills." Another similar rock named "Zhong Shan" is just out of view to the left of this area. Both rocks were analyzed by Spirit's miniature thermal emission spectrometer and the results indicate that they are likely iron meteorites. Image and caption by NASA. Enlarge Image. Allan Hills: Rocks found near Spirit's winter station were assigned informal names honoring Antarctic research stations. Zhong Shan, the large rock on the left, is named after an Antarctic base established by China in 1989. Allan Hills, the large rock on the right is named after a site where meteorites are frequently collected because they are relatively easy to see as dark rocks on the bright Antarctic ice. Image and caption by NASA.